Small boats are seen in Thailand's Surat Thani province. Bangkok (NNT/VNA) - The Temporary Crisis Centre of Thailand has just held a meeting to discuss the movements of tropical storm Pabuk and floods that may occur. Deputy Director-General of the Royal Irrigation Department presided over the meeting to monitor and analyse the effects of the storm. Irrigation offices in charge of affected areas are preparing waterways based on existing water data and monitoring the movement patterns of the storm, while readying water pumps and flood relief equipment. The centre will provide alerts to local branches which have been ordered to be on standby around the clock with their respective department directors on duty. 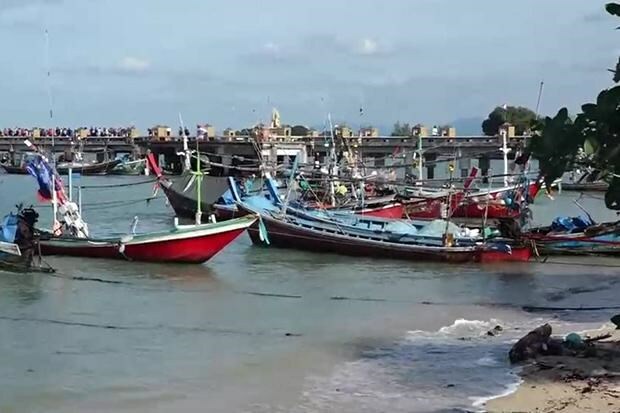 Local reports indicate that the irrigation office in Prachuap Khiri Khan is accelerating irrigation in the area, drawing from the lessons of the previous flooding in Bang Saphan district. The office will survey water obstacles and prepare its reservoirs for more uptakes. The office in Nakhon Si Thammarat is also preparing its dams for more water in-flow. The office in Songkhla has installed water pumps and equipment necessary to direct water into Songkhla. The office in Narathiwat reported that current water levels are not a concern and have installed pumps and equipment in risk areas. The office in Nonthaburi has reported that its flood gates are fully operational and it is currently repairing two water pumps. The office in Kanchanaburi said water levels are below problem points, but they are preparing equipment to be ready for any eventuality.